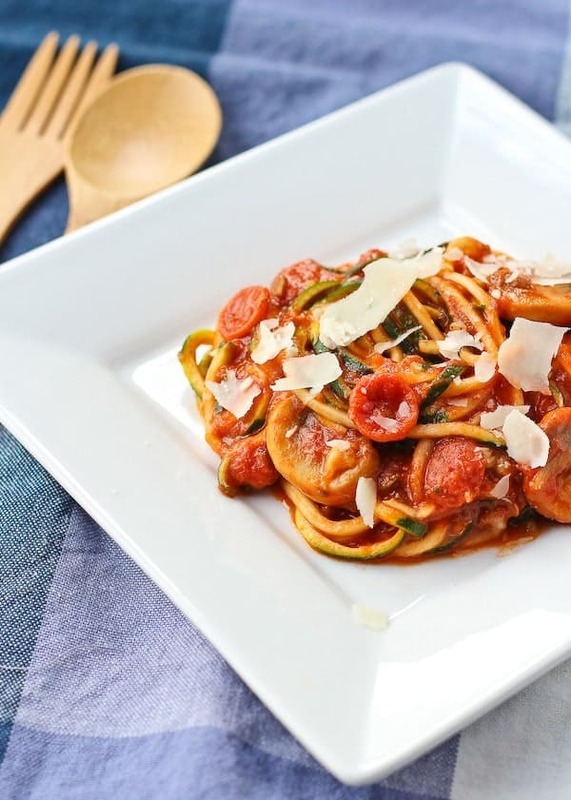 By this point, you’ve probably realized how much I love my spiralizer and zucchini noodles. And of course I’m obsessed with all thing pizza — who isn’t? I actually just had pizza for dinner tonight. But it was the kind with thick crust and lots of cheese. The kind that tastes oh-so-good but leaves you feeling huge and overly full. Still full 3 hours later. That kind of pizza. Otherwise known as Jet’s BBQ Chicken Pizza. With cheesy bread. Because there’s always cheesy bread when we have pizza. Are there people in this world that eat pizza without cheesy bread? I felt a little better about it because I had a Hungry Root meal for lunch — they sent me some samples (not paid to say this! ), and DANG. That sucker was good. Ready in 7 minutes and under 400 calories. I might be in love. Again – not paid to say this! It just so happened to make my lunch dreams come true. And then Jet’s pizza made my dinner dreams come true. Ohhhh boy. Everything in moderation, right? Although I didn’t even work out today because the moderately acceptable daycare had 11 kids in it and food smashed all over the floor. I tried to get on the elliptical but my gut was screaming for me to get them out of there. So I did. Do you think my 1-minute elliptical workout earned me Jet’s pizza? There’s always tomorrow. 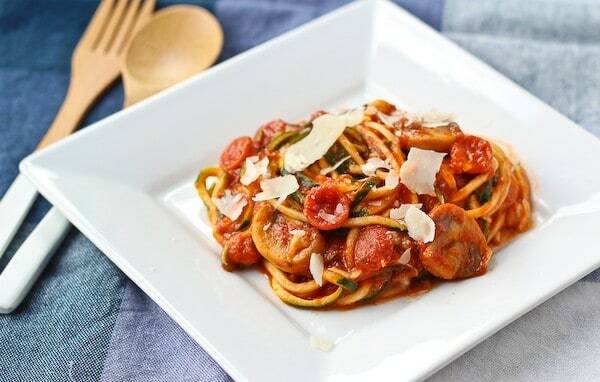 Getting back on topic, these pizza zucchini noodles come together in less than 30 minutes making them a perfect dinner. I used mushrooms and pepperoni but feel free to substitute those with any of your favorite pizza ingredients. Red bell peppers, ham, whatever you like. If you don’t have mini pepperoni, I’d cut regular-sized pepperoni into quarters so that it gets distributed throughout the zucchini noodles. In a very large saute pan, heat oil over medium-high heat. Add mushrooms and season with a pinch of salt and pepper. Saute mushrooms until browned and cooked. Add pepperoni and saute until slightly golden brown and curved. Reduce heat to low and add sauce. Add mozzarella and cook until melted. Add zucchini and cook for 2-3 minutes or until slightly tender. Serve immediately topped with grated parmesan. Verdict: Yum! Loved these – and really loved how quickly they were on the table. Ben’s take: No complaints! He loves zucchini noodles just as much as I do. Unusual pizza. A good recipe for every day, thank you. I think I’m the only person who hasn’t made spiralized veggie noodles. What the heck am I waiting for? This looks amazing! I love how healthy this looks! 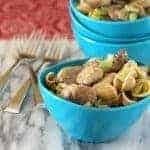 These pizza succhini noodles are definitely on my list to make tomorrow “oooh, yummmm!” I will let you know how it turns out. I just discovered your blog. I have never tasted this kind of pizza by now. 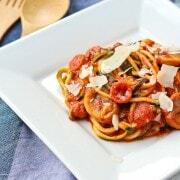 I must try PIZZA ZUCCHINI NOODLES WITH MUSHROOMS AND PEPPERONI. Yummy yummy! Who can resist pizza taste right, especially which has pepperoni. It looks so wonderful and tasty that I can’t hold myself from craving. I think it must be healthier than ordinary pizza, um, I don’t know, who cares, I love it after all. Thanks so much for sharing! It’s definitely healthier! Hope you love it! zucchini, mushroom and pepperoni, three are my favorite food items and I love the pizza thing very much, so its a great recipe and our whole family loved it, cheers! pizza is such a sinful food, it is hard to relish it without feeling guilty about calories, thanks for sharing such a healthy and awesome recipe! you got me at pizza! This looks awesome! YUM!!!! I love the zucchini noodles, so mcuh that I actually trew all of my pasta out. Great recipe! So glad you’ve joined the spiralizer revolution. 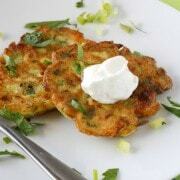 I am sharing this today on the Low Carb Test Kitchen FB page because my followers will love it! 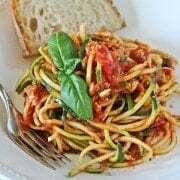 Zucchini noodles are the best! I love this healthy twist to get my pizza fix! It looks incredible! 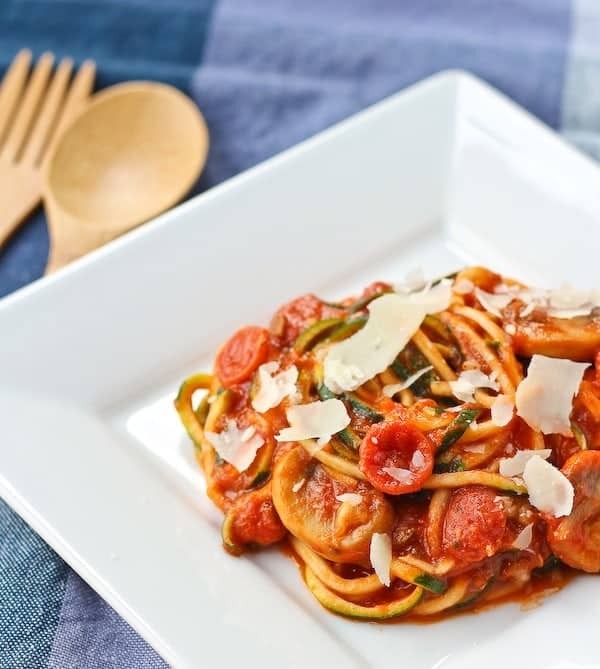 This is just one more reason I need to get into spiralizing! It looks SO good Rachel! I must get a spiralizer. This is the best recipe I’ve seen yet :) PINNED! 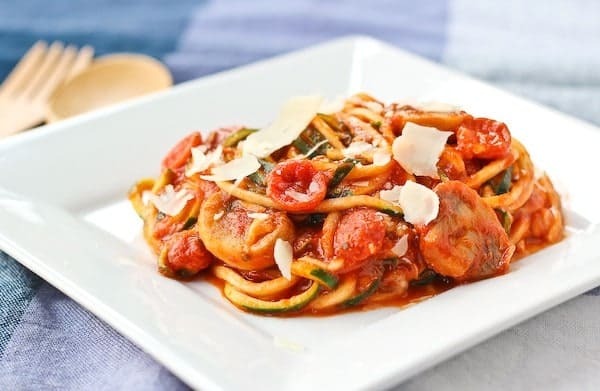 OMG this looks SOOO good, I might have to make this tomorrow, I’ve been wanting to make some zoodles but didn’t know what kind of sauce to use- adding some pepperoni to my shopping list now! ;) Thanks for sharing! Yum! This is my kind of pizza!